Our mission is simple: Bringing the copier industry into the 21st Century and helping small to medium size businesses grow and prosper! Flat Rate Copiers started with the objective of helping small to medium size businesses qualify for large multifunction copy machines. It’s difficult for new businesses to qualify for expensive equipment especially since new businesses don’t have established business credit. Flat Rate Copiers saw an opportunity to help these types of businesses qualify and grow by simplifying the approval process. Our instant online quote tool allows companies to create their own quote based on their budget and printing needs. Business owners and administrators can create, save, download, and even share their various quotes and apply for a copier on lease in New Jersey within seconds. We are putting the proposal process in the customer’s hands! Our goal is to get a great copier in your office as easily and quickly as possible. We’ve taken the “haggling process” out of leasing a copy machine by offering free delivery, setup/installation, as well as a 6 hour response time on all service calls anywhere in the states of New Jersey and New York! We have become leaders in the copier lease industry because we believe that a copier lease in New Jersey contract is only as good as the service and response time that supports it. Bustling cities like Patterson, Jersey City, and Elizabeth support all types of industries and it’s for this reason that Flat Rate Copiers offers different leading copier brands like Ricoh, Canon, Konica Minolta, HP, and Brother to fit each individual company’s needs. 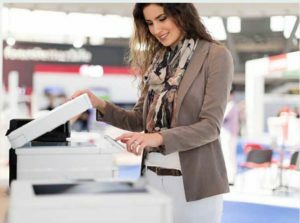 Whether you are a new business or large corporation,we believe that leasing a copy machine will help save you money not just on maintenance but on copier toner and ink. Small desktop printers like HP and Brother have very low toner yields costing company’s a fortune with very slow printing capability. This is one of the many reasons why leasing a multifunction office copier is the way to go! Both your printing capability and efficiency will triple and sometimes quadruple because they are capable of processing one to two prints per second! There is also the added benefit of having features like faxing, scanning, scan to email, Bluetooth technology, stapling, and collating. Large multifunction copiers are also great because you can setup over 20 computer work stations to print from them decreasing your need for multiple copiers or printers. If you are interested in a copier lease or copier rental in New Jersey areas ,please visit our website www.flatratecopiers.com and check out our instant quote tool. You can create, download, or email multiple quotes at a time and create a quote that fits your office printing needs and budget. Our focused copier service areas include Jersey City, Paterson, Trenton, Elizabeth, Hoboken, all major areas in New Jersey.